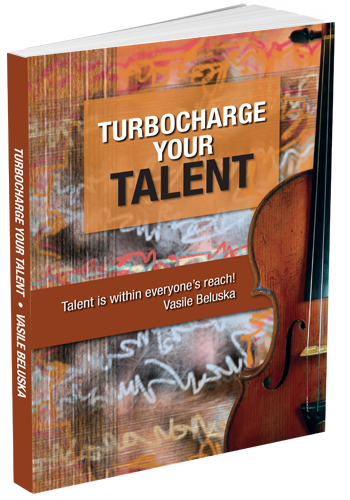 In Turbocharge Your Talent, Vasile Beluska makes his case for his belief that talent is available to anyone. There are no “secrets” per se; many factors have to converge to become talented in any field. The book can be read as a novel, start to finish, but it becomes technical in the second half which is dedicated to string instruments, particularly the violin. Professor Beluska prefers to use his book as a reference tool. By simply reviewing the list of “Laws” at the end of the book, the reader is directed to find explanations for issues in talent development and, later in the book, specific string instrument techniques. There are short, personal stories throughout, to illustrate points and to give a different perspective.